"There's always that moment when you realise how much freedom you have"
Membrane is a creative action puzzle game that's landed on the Nintendo Switch eShops and it's already made quite the impression on us - just check out our glowing review. 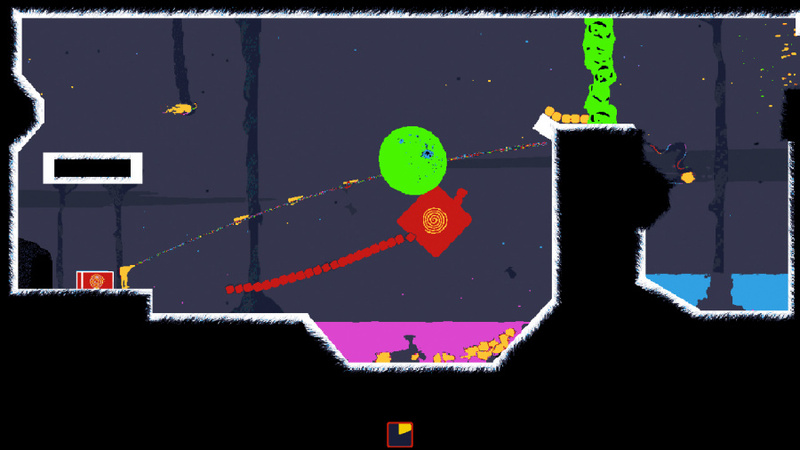 It's the brain child of husband and wife development team Perfect Hat and it's proved to be one of the most unusual indie hits we've played in quite some time. 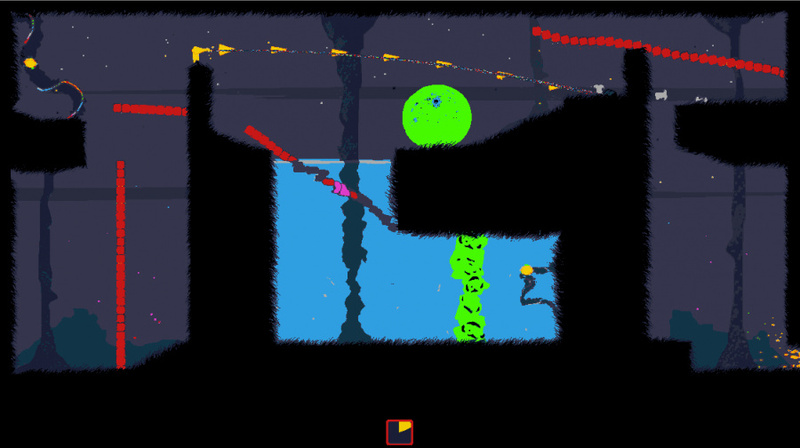 Rather than perplex and deceive, Membrane gives you a great degree of freedom in creating solutions for environmental puzzles and navigating the vividly coloured world on your own terms. Nintendo Life: Congratulations on the release of Membrane on Nintendo Switch! Is this your first game console release? Seth S. Scott: Yeah! I have released some games on iOS/ the Android Store as well as a handful of outlets such as itch.io and other mediums, but Membrane is our debut console release! Jess and I have been together for about a decade now. We were both artists and musicians before we met, and then naturally combined our efforts in those mediums once we became BFFs/In a relationship. Now we are married and both of us are trying to succeed in being creative as our main forms of work/careers. I predominantly focus on games, art and music while Jess is an amazing ceramicist/ sculptor as well as into art, music and games. You have a background in art and music- when and why did you make the transition into video games? I was born in the early '80s so I grew up playing games. Nintendo, SEGA, you name it. I have always loved games and dabbled in making them in my spare time until just recently when I decided to go back and get my Masters in Game Design. Membrane started as my thesis project for my Masters, and now here it is today. Does your art influence your game(s) or vice versa? I definitely think it goes both ways. I have a handful of prototypes that have started from a random idea or piece of art. What are the aesthetic and mechanical influences for Membrane? I definitely am extremely inspired by other indie game devs and teams. Playdead, Tomorrow Corp, Amanita Design, Jason Rohrer, Fullbright. I would say all of these devs, along with many others, influence all aspects of my work but more so in design aspects than aesthetically. For Membrane, the aesthetics were born out of functionality and scan-ability for the player. I wanted levels to be clear and easy to parse for the player the second they saw them, so I came up with the idea for the hot & cold, Day-Glo colour palette. Things would easily be distinguishable from others and easily paired together if their colours matched. It then grew into this semi-psychedelic inner-body motif because we liked the idea of this organic and weird world setting. What can't you put inside a body eh!? Then I knew I wanted the world to feel detailed, tactile & tiny. Jess and I love exploring small worlds in games and we really wanted the world of Membrane to feel aesthetically alive, but also worked to make sure it wasn't too cluttered with set dressing or distracting to the player. We wanted the aesthetics to be satisfying and satiating to the player but always lead their focus back to the gameplay and puzzles within each level. One of the most interesting elements of the game is the balance of function versus artistry. How did that idea start to develop? The very first prototype gave the player a completely empty room with one tool, it was a combo between the two tools (red brick, yellow shard) players have in the final game. It built like a brick but looked like a shard - oh, but it also had no physics, it was stiff when connected with others like it. I was amazed at how everyone that played built very different structures with that one single tool. They were in a blank room with literally nothing to do but get out of the top of the screen and they were having fun building stuff already. I knew then that if I was able to curate a handful of levels whose architecture and design slightly nudged players to different goals would do nothing but expand that creativity tenfold. What has player reaction been like when showing Membrane at game events? Reactions from people are great, but it's always all over the place at any gaming event. There is always that moment when players think the game is just a simple platformer, and then about one minute in realizing the freedom and creativity they have. Did this help with development? Play testing a game, no matter the genre, style, etc most definitely helps with development. If you are not playtesting the game outside yourself or your team you are losing out on free advice and critique from literally the exact people you are going to try and sell the game to when it comes out. It's hard to show something before you think its perfect. In development, you have all these ideas and images of the what the final game is going to be, so as you are making it, and its broken here and not polished there, its super scary to wanna show it to people. But you have to. You need people outside the dev team to tell you what they dislike or find rough about the game. Conversely, you also might find out some things that people SUPER love about your game, which is always great! 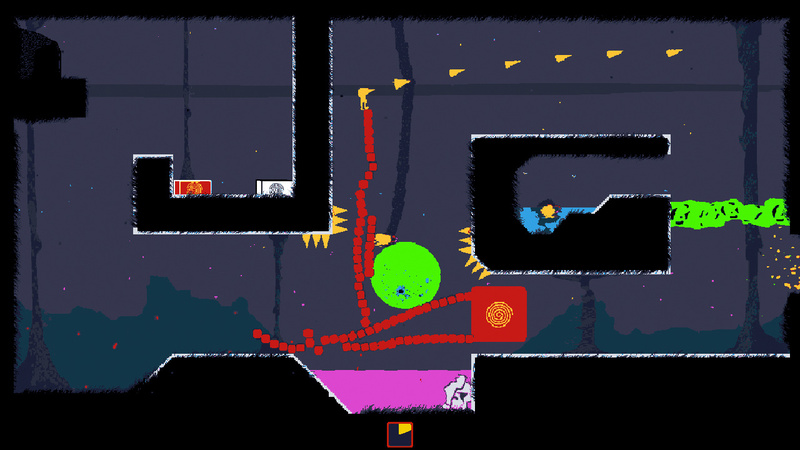 Puzzle games inherently rely on a successful balance between accessibility and challenge. With many potential options for solving a particular puzzle, how hard was it to find that balance? It definitely was something that was hard to balance. I had a small sketchpad with me and I would constantly just draw down little ideas I had for levels, obstacles or challenges while I was on the subway or something. Then when I got home I would create a level around that drawing to try out. If I was able to personally solve the level at all. What puzzle games do you enjoy? Jess and I both adore puzzle games. Some of our recent indie favourites over the past couple years include Little Inferno, Inside, The Witness, Unravel, Plug & Play, Lumino City and Gorogoa, We also love classic point and click adventure games like King's Quest, Monkey Island and modern retakes like Machinarium or Broken Age. There are also strategy games like Pikmin or The Flame In The Flood that definitely have RTS puzzle elements to them that we love. As the character Sig, are your resources limited? You have 100 bricks to build within each level. These reset in each room so you don't have to collect them all back to have them to use in the following room. I didn't want players to feel like they were always gonna run out of bricks to build with so most of the challenges are not about using all 100 in just the right way. But initially, when prototyping out the game, players had an unlimited amount of bricks they were a bit too careless with what they were making. Once I started putting limitations on their inventory, even in a way that wasn't punishing, it was interesting to see players start to be very conscious and thoughtful about how they were building. It was was nice to see. Does this change throughout the game? It does not change throughout the game. Although there may be something that slightly alters the functionality of your bricks making them seem a bit more dangerous to Sig. How does the game progress in terms of puzzle difficulty or complexity? The game definitely does have a difficulty arc that increases but it doesn't just get harder and harder the more you play. The structure of the game was ultimately focused around a handful of environmental elements that I came up with (i.e. Springs, Spinners, Electricity, etc) and then I designed a handful of levels around each of those. So as the game goes on, as each element is introduced there is a level or two where you learn about each new item and then get to explore it and learn what it does. I think players need to have moments when a game forces them to relax for a minute or two after a handful of puzzles. It's important for them, whether they recognize it or not to get a brief pause and cleanse their palette before diving back in for more. Is there an overarching story or end goal? There is a narrative that runs through the game. It was Jess' idea and then we ran with it. I am absolutely in love with the 'simplicity' of it all. Are there any other characters you interact with or play as? You play as Sig for the entire game. How many types of environments/ hazards can we expect? There are seven sections of the body you play through in Membrane and each one has a handful of different hazards and contraptions to interact with. Were there any ideas that you tried out but didn't include in the final game? Yeah, I probably had 20-25 levels, and maybe three to four other environmental elements that didn't make it into the game. What can we expect from Membrane and Perfect Hat in the future? More games! Hopefully, we can find enough success with Membrane to fund our future development full-time so we can continue making games. We have a couple different prototypes in the works currently and look forward to bringing them to players soon. What Nintendo games did you play growing up? OH MAN. A TON. Hard to narrow this down, but I'll just go off the top of my mind at the moment. Mario 1, 2 & 3, Bubble Bobble, Dr Mario, Xexyz, Adv. of Lolo, Super Dodgeball, Super Mario World, Mario Kart, Mario RPG, DK Country, Kirby's Dream Course, Tecmo Super Bowl, Mario 64, Bomberman 64, WCW vs NWO. I guess those aren't all necessarily 1st party Ninty games, but when I think of playing NES, SNES & 64 those are the games that pop up. We would like to thank Seth for his time. Membrane is available now on the Nintendo Switch eShop now. WCW vs NWO eh? I knew this guy had to be alright. 1 comment in five hours? looks very interesting. thanks for these little interviews with the 'little devs', I like em!